Almost missed the time change. Was there a time change? Good Maen, good people. Yes. There was a time change. The site calendar rolls an hour earlier than during the North American summer months. 9 am EDT instead of 10 am. The Apostles are on my bucket list! BTW, Easy solves 1-&GT;9 if you skip 3 and 6 then go back to them. Enjoyed watching the Aussie males running amok on the site last night! But hope your day is filled with sunshine - one way or another! Slept in after all day Cribbage tourney. Did better this week, ending up in the top 8 out of 84 players. I think colder weather is trying to blow into the Valley today. Today is the critical game for the Rockies. They win, they play again. They lose, they are done until Spring Training. I am enjoying a rare day off today. Ha! As if! Peter, did you have HER permission to post that? Sarah (DC) Enjoy your two day celebration. I am just wondering if Arachnid ever got his ''lightly poached egg''. Or, more realistically, WHERE he got his ''lightly poached egg''. 2:13. A belated Good Morning! everybody, Aussie males run amok Judy? What did I miss, hafta go and have a look. Lovely photo in the mist. Appropriate name for this place also. I do try other brands of beer but keep coming back to VB. I've even tried craft beer. 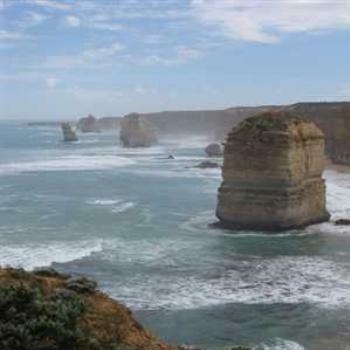 Morning all,nice pic of the Apostles,thanks Vici. Always knew the men on this site were good for a laugh. 😂😂😂😂 Just read yesterday's comments . cleaning up almost over ... then going for a walk, and watching colors of the trees ...now are yellow,light green and vibrant dark red ... each tree as his own color... until rain and winds bring music for the leaves to fall down.